Speak with Ali Morisane in the Al Kharid market. First off, talk to Ali Morisane located north of Al Kharid near the Gem Seller to begin the quest. He wants you to go visit his nephew in Pollnivneach. Buy a Fake Beard and Headpiece from Ali, and use them together to make a Desert Disguise, which you must wear. Now head south to the Shantay Pass. You should also buy some Waterskins (at least 4) and some Desert Robes, and then head through the Shantay Pass. There are two main ways of getting to Pollnivneach. First, you could take a Magic Carpet Ride from the Shantay Pass rug merchant for a fee of 200gp. 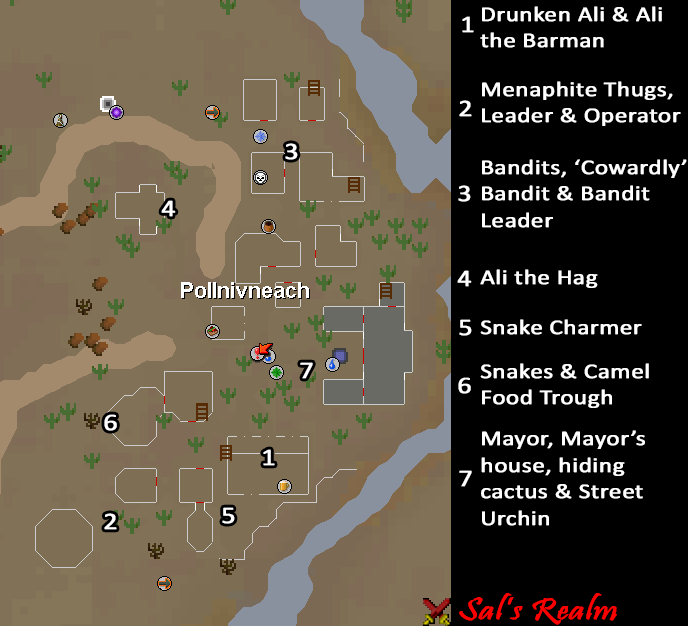 If you have a Ring of Charos (a) equipped, or if you have completed building Ali Morrisane's store, the merchant will give you a ride for only 100gp. If you've finished the store and have a ring equipped, he will lower it to 75gp. You can also head south past the Desert Mining Camp, and then head east to get to Pollnivneach. Once there, you'll notice that everyone is named Ali! Talk to Ali the Barman and buy 3 beers. Talk to Drunken Ali, who will ask for beer in exchange for information. After giving him the 3rd beer, he will tell you that Ali has been involved with the Bandits and Menaphite Thugs. Now you need to speak with each of the gangs. Head north of the bar and talk to any Menaphite Thug. Then, talk to any Bandit, their camp found north of the bar. The gangs will tell you that a Camel was stolen, and that they are at war. Buy 2 Camels from the Camel Shop for 500gp, and give a Receipt to each of the gangs; one to Ali the Operator and one to 'Cowardly' Bandit. Now they want 10 Camels! Your character says that this will not work, so he suggests joining a gang. Go speak to Ali, the Chief Operator in the south part of town. He wants you to pickpocket 3 Villagers. The first one can be pickpocketed as you would normally. After successfully pickpocketing the first villager, go back to Ali the Operator and ask for advice. He will tell you that you should try using a distractor. Go back to the town centre and talk to the Street Urchin, asking for his help and paying him to distract someone. A flashing arrow will appear, telling you which villager you should pickpocket. After pickpocketing the second villager, go back to Ali the Operator and again ask for advice. This time he will tell you to try knocking the person out first, and will give you an Oak Blackjack. Lure a Villager into an empty house (with no other people), knock them out and pickpocket them. Now go back to Ali, who now wants you to steal the Mayor's wife's jewels. He will give you the Keys to the house, which can be found in the center of the city. Make sure you're wearing a pair of gloves! 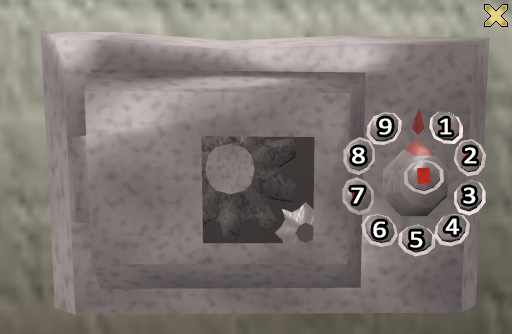 There are 3 cacti that you can hide behind, and once you get a message saying that no one is inside, enter the house and search the desk for the Combination (the last number, 8, is not on the note). Then go upstairs and search under the bed for a note, and then search the painting to find a Safe. Enter the combination: 1-1-2-3-5-8 by clicking the numbers one at a time. You'll then receive a Jewel, which you should bring back to Ali. Now Ali wants you to root out the traitor in the gang. Talk with any Menaphite, and he will tell you that the traitorous Ali betrayed his own family. Go back to the Operator, who says that you need to find a way to kill him silently. Talk to Ali the Hag, a short distance north-west of the Kebab shop, who says that she needs a snake and some camel dung. Go to the Snake Charmer found outside the Bar and put some coins in the money pot. He will give you a Snake Flute and a Basket. Use the flute with any Snake near the Menaphite tent, and once it's in the basket bring it back to the Hag. Get some extra Hot Sauce from the Kebab Seller and use it on the Camel's Food Trough. Use a bucket on the Dung and bring it back to the old Hag. Tip: Hot Sauce can be used on Kebabs to make Super Kebabs! The Hag will give you the poison in a Vial. Bring this back to the Bar and talk with the Barman. He will tell you that the Beer on the table belongs to the traitor. Use the poison on it and go back to Ali. Speak with the leader of the Menaphites, who should be nearby. He wants to dominate the world! A level 78 Tough Guy will spawn, and after being killed will drop a Willow Blackjack. The Menaphite Leader will then leave the town. Go speak to any villager within Pollnivneach, who will get angry at you for banishing the Menaphites and demands you do the same with the Bandits. Go north to the Magic Carpet Rides where you will find the Bandit Gang Leader. Speak with him and he will want you to fight his best man before leaving. A level 78 Bandit Champion will spawn, and will drop an Adamantite Scimitar upon death. Speak with the Bandit Leader once more and he will leave town. After that, go speak with another villager who will direct you to the Mayor. The Mayor will reveal the Ali had to leave town for his own safety. Finally, head back to Al Kharid and talk to Ali Morisane, who will tell you that the whole quest was a ploy for boosting the tourism of Pollnivneach. 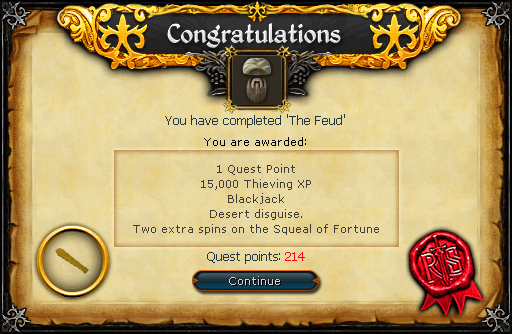 Quest complete!